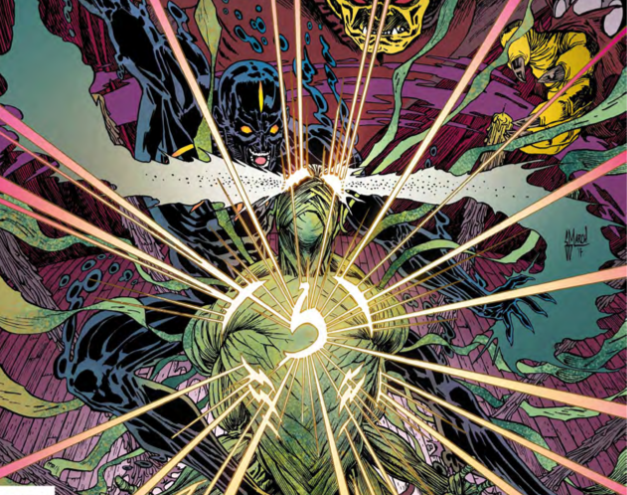 Ragman #3 Review – AiPT! An already interesting series is kicked up a notch! Ragman has the potential to be one of the most interesting characters in DC Comics. As series artist Inaki Miranda put it, the character could end up on the Justice League. So far, the series has slowly developed the character’s origin and with his powers explained it’s time to flesh out the plot! Ragman is a rather underdeveloped character and this new series allows DC to flex its muscles with another supernatural hero. If you’re a fan of Constantine or Swamp Thing you’re going to enjoy the darker tone and mystical nature of the character. This issue kicks things into gear, raising the stakes and pace of Ragman’s mission. He’s been taking out demons across the city and in one awesome full page montage Miranda reveals he’s getting the hang of this superhero thing. This issue is very economical and reads like we’re getting the content of two issues of a typical American comic. It opens with Rory talking to his father, setting the readers up if they’re just jumping on, cuts to some action, drops a cameo in, cuts to a flashback for a villain, then drops Ragman into a dicey situation involving portals to Hell. This conflict evolves into Etrigan’s entrance and on top of all that we get a reveal as far as how high the stakes are rising. All in all, this issue packs in a lot of character, action, and killer art. The military angle is an interesting one that rears its head a few times in this issue. Rory for instance has a style of fighting that others note is clearly based on military action. The villain who is empowered later in the issue has his own military background too. Early on, Fawkes writes strong captions which capture Rory’s point of view on the current battle and how his battles in the Middle East have carried over to this new war. One could say that’s an allusion to the PTSD and baggage soldiers take back home and this adds an interesting layer to the narrative. The issue looks excellent and while it’s heavy on the inks with a darker tone, the color by Eva De La Cruz is allowed to splash in the yellow light of the city, the red glowing eyes of the demons, and some interesting pinks and yellows in the seance scene. Ragman’s look is pretty cool and differentiates from other heroes with tendrils (I’m thinking of Venom for instance). The entrance of Etrigan is a major moment that Miranda sells well too. It’s close to perfect, though the seance scene runs a bit long. The book’s pace is excellent, don’t get me wrong, but it bounces around and cuts between some interesting scenes in quick efficient ways, which makes the longer seance scene seem slow in comparison. This is an excellent supernatural story that’s kicked up a notch in this latest installment. If you haven’t jumped on board yet, dammit do so now! This is an excellent supernatural story that's kicked up a notch in this latest installment. If you haven't jumped on board yet, dammit do so now!